Dr. Josée graduated with a Bachelor of Arts degree in Psychology from the University of Calgary in 1990. She then attended Northwestern College of Chiropractic and graduated with a Doctorate in Chiropractic in 2001. She obtained her certification in VSMT (aka Animal Chiropractic) in 2005 from the *Healing Oasis in Sturtevant, WI. This process entailed a total of 8 ½ years of full time studies at the undergraduate, graduate and post-graduate levels. Soon after starting her human practice in 2001, she spearheaded the process to make it legal for trained and qualified chiropractors to practice animal chiropractic in the state of Minnesota. 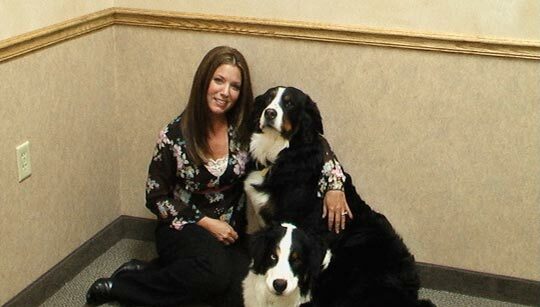 In 2005, Dr. Josée started her animal practice in Wisconsin, where animal chiropractic was legal. Because of the high demand from the animal owners for this type of care, her practice quickly became the largest practice in the area, with owners driving up to 3 hours each way so that their animals could receive chiropractic care. When the laws were successfully changed in Minnesota in 2008, she added a second practice in Lino Lakes, Minnesota. In 2012, Dr. Gerard moved back to her hometown of Calgary, Alberta and now sees animal patients in Airdrie, Calgary and surrounding areas. Dr. Josée kindly offers presentations on Animal Chiropractic as a public education and community service at no charge. She has given presentations to many dog clubs, veterinarian clinics, canine training schools (agility and obedience), business groups such as BNI and Chamber of Commerce. She has also been an invited to speak to groups of students and doctors at Chiropractic universities, as well as Veterinary Tech programs.